Unnaturally blue cocktails are always a hit. But what about the non-drinkers? I created the Blue Shoe mocktail so they too could enjoy a bright blue drink with no alcohol. My main ingredient is a blue variety of Hawaiian punch called Polar Blast, but if it’s not available in your area, any blue fruity beverage will work. The taste of this one is a mishmash of sweet and tart fruit with citrus. Of course, the taste will vary depending on what blue soda you use. But as long as the soda tastes good, so will the drink. That’s where most of the flavor comes from. This makes for a really beautiful drink. It actually looks like a drink that features Blue Curacao. And that was my goal: to create a delicious drink that really looks like a cocktail, so non-drinking guests don’t have to feel like they’re standing around with an obvious non-cocktail. You can also mix up a pitcher of it in advance of a party and keep it chilled in the fridge. If you don’t have time to chill your ingredients before mixing this one, put some ice in a mixing glass, add the punch and cranberry juice to it and stir until the glass is very cold to the touch. Pour that into a chilled martini glass and then add the 7-Up. The Blue Shoe is a non-alcoholic "mocktail" I created so non-drinkers could enjoy a blue, bubbly cocktail. It features the flavors of berry, cranberry and lemon-lime. 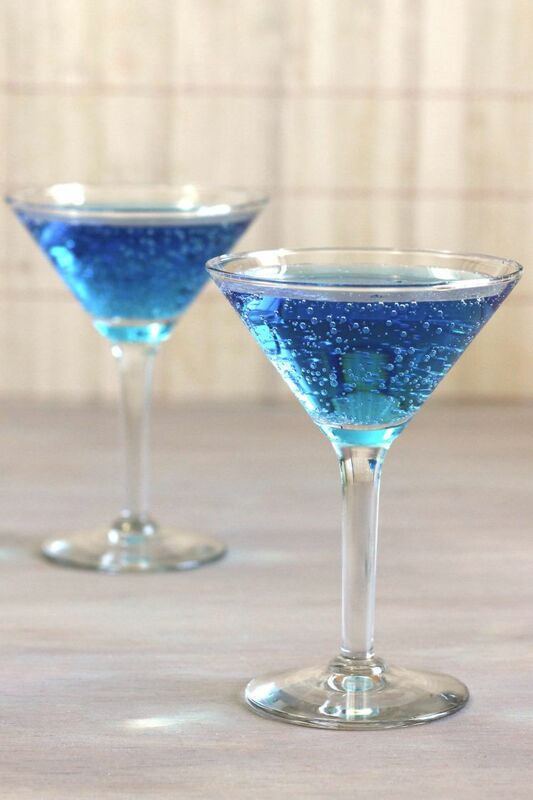 Pour the blue Hawaiian Punch into a large, chilled martini glass. Add the white cranberry juice. Fill the rest of the way with 7-Up. I love site. I learned many things from here. Is it possible to have it be sprite instead of 7-UP? Can this drink be put in the freezer & served as a slush? I’m looking for a blue slushy non-alcholic drink for bunco as my theme is winter. That should work! I haven’t tried it, but I think it would work. That would be a great mocktail for a baby shower! Thanks for the idea! How can I make this in bulk for a wedding reception? What if you can’t find cranberry juice in your area what can you use ? You could leave it out. If the blue fruit juice you pick is tasty, just it and the 7-up will be great.